While most major crimes declined in New York City last year, the theft of iPhones and iPads remained one of the driving forces classified as grand larceny in the fourth degree, according to data released by the New York Police Department and cited by the Wall Street Journal. 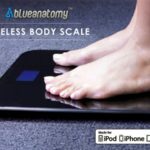 To put that into numbers, in 2013 iDevices made up more than 18% of all grand larcenies, which means more than 8,000 iDevices, while back in 2002 there were just 25 cases involving Apple products, the report reads. This has happened at a time when murders decreased by about 43%, robberies by about 30%, and vehicular theft by about 72%. 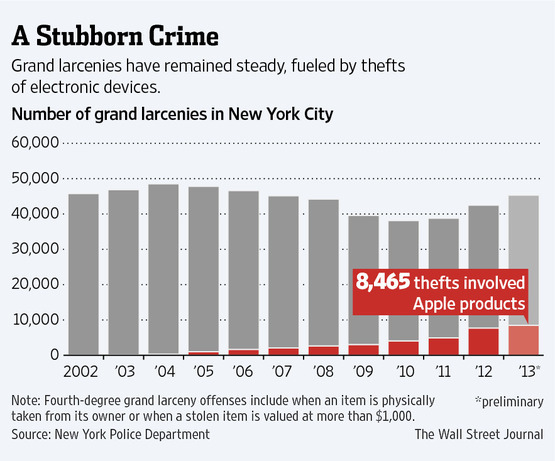 The number of grand larcenies has been steadily increasing since 2010 in New York City, but looking at the nationwide picture, statistically the number of grand larcenies is decreasing, according to figures compiled by the Federal Bureau of Investigation. With its Find My iPhone feature, Apple has helped its customers track their lost iDevices. But this simply hasn’t been enough. Apple’s next move, the Activation Lock feature implemented in iOS 7, was applauded by New York Attorney General Eric Schmidt and George Gascón San Francisco district attorney, however, who have lobbied the industry for a “kill switch”. On the other hand, combating grand larcenies is complicated, the WSJ highlights, because many victims lose interest in finding their phone; they stop at filing a police report and won’t spend time looking at photographs of potential thieves.